The perfect gift, this 5-DVD-SET of our top-selling basic videos, has all the knowledge a beginner needs to get started fly fishing. Packaged neatly in a sturdy and attractive display-box, the unique and eye-catching collection is filled with concise instruction and detailed demonstrations. A great bargain as well, these top-selling DVDs are a $100 value and are priced at more than 40% off. Equipment, tools, flies, knots, rigging, terminology, and even entomology are all part of the Fly Fish TV “How To Fly Fish 5-DVD-SET”. Professional fly fishers guide the novice through everything they need to know to get started. Understanding the equipment, learning the basic knots, assembling gear and fly line, selecting flies, and a host of fishing and casting tactics are detailed. 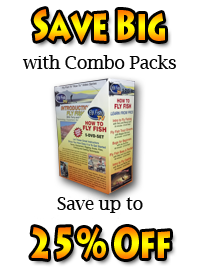 “I always wanted to Fly Fish” is something we’ve all heard; now there is an easy response … “Get the Fly Fish TV How To Fly Fish 5-DVD-SET”. Nationally respected anglers Terry and Wendy Gunn, Skip and Carol Morris, Maggie Merriman, and Jay Buchner take the uninitiated gently into the Fly Fishing world. They hit just the right balance between instruction and entertainment that lets the beginner learn without being intimidated. All the basics of angling and casting are broken down into unique lessons that the beginner can easily learn and then take to the water. Trout and Bass & Panfish are covered in separate fly fishing video productions, each with step-by-step strategies for catching these popular species. Get Started Fly Fishing Now with the “How To Fly Fish 5-DVD-SET”, or give this classic collection of videos to a friend or relative that you know would enjoy the sport. Got this from a buddy of mine...I've been wanting to start fly fishing so we can go on a trip together. I just didn't know where to start and there is so much info out there! After watching the intro to fishing and casting videos I felt confident enough to start shopping for gear. Now I'm set up and practicing my casting!